A colorful and festive salad that is a fun alternative to lettuce during the Fall and Winter months. Heat a small skillet over medium heat. Add the hazelnuts and toast in the pan for 5 minutes, tossing them to avoid burning. Set aside to cool, then roughly chop. 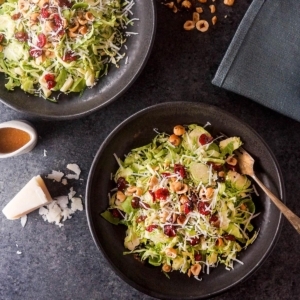 Put the Brussels sprouts, toasted hazelnuts, grated parmesan cheese, and cranberries in a large serving bowl. Toss the salad with some cracked pepper, if adding, and your desired amount of dressing. Serve immediately, garnished with Parmesan cheese.